Lloyd Sachs explores the life, times, and endless journeys of singer-songwriter-musician T Bone Burnett. In recording period music," says Burnett, "people usually are so focused on getting the form right that they miss the content." It would be easy to dismiss Joseph Henry “T Bone” Burnett as simply one of the luckiest musicians of the past 40-plus years. From his entrance onto the national stage as a member of Bob Dylan’s legendary 1975-1976 Rolling Thunder Revue, Burnett was hard to miss. He was the perfect visualization of lanky; a giant, skinny Texas boy who provided steady support to Dylan’s traveling caravan of wandering minstrels. 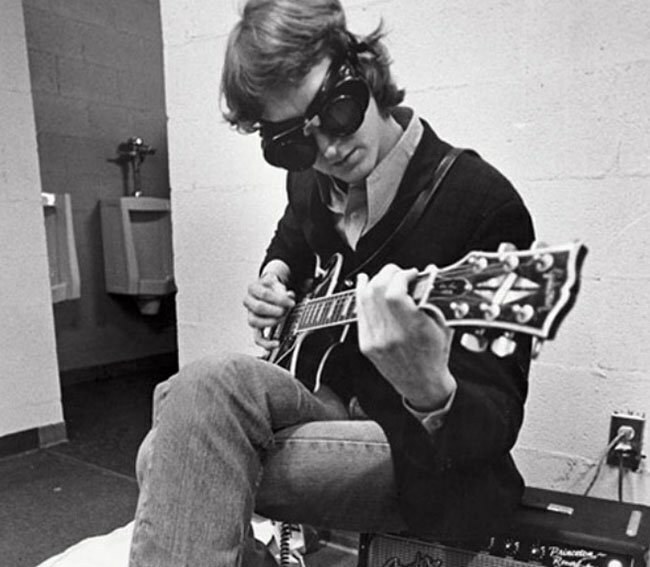 From that point on, Burnett tried to define himself as a solo artist in the Southern California acerbic singer-songwriter vein, a little absurdist Lewis Carroll mixed with acid-tinged Warren Zevon and sensitive Jackson Browne. In the '80s he tried to balance a solo career with production work for new and established artists. Either the whims of a fickle audience or Burnett’s commitment to the pursuit of that perfect sound led him to focus primarily on film and TV scores and song curation and music production for artists in line with his sensibility and commitment to what biographer Lloyd Sachs properly labels “a life in pursuit”. The problem with trying to pin down T Bone Burnett comes when a biographer might feel obliged to cover all aspects of the artist’s career, and Sachs does not have an enviable task here. That’s what makes this an interesting, worthwhile, yet at times inconsistent biography. The seeds of this book apparently originated as a feature profile for No Depression magazine, (where Sachs was a senior editor), and the sometimes conversational, magazine journalism style seems to be at odds with a more suitable and detailed academic approach. It leaves the curious reader wanting just a little more about the motivations behind such remarkable musical soundtracks as the Coen Bros.' O Brother, Where Art Thou? (2000) and Inside Llewyn Davis (2013). Sachs’ has good access to those around his subject (Roseanne Cash, Joe Henry, Bob Neuwirth, David Mansfield and more.) Burnett’s radio silence when it comes to reflecting directly to Sachs for this book about some landmark productions hurts, but does not ruin, the flow. (Fortunately, Sachs can depend on earlier conversations with his subject, and he puts them to good use.) Burnett didn’t seem to insist on colleagues not cooperating with Sachs, though, and their testimony to his peculiarities, predilections, and brilliance do their best to create a bigger picture of the man and his music. Who, then, was (and is) our subject? T Bone Burnett: A Life In Pursuit wisely opens with the strange and in any other hands probably impossible Raising Sand, the 2007 collaboration between Led Zeppelin hard rock and blues lead singer Robert Plant and bluegrass darling Alison Krauss. The contrast between Plant’s sometimes strangled moans and ravaged exhalations and the sublime perfect beauty of Alison Krauss’s voice seemed like two trains on opposite tracks doomed to crash in the middle of their respective journeys. It would be hard not to think that Burnett had an ulterior motive here when it came to signing Plant onto this project. Led Zeppelin, like many British bands of the late '60s and into the '70s, had long been accused of co-opting and re-appropriating black music for their own purposes, recording versions that sounded good but felt insincere. Led Zeppelin had in fact been sued by Willie Dixon for credit on one of their songs, “Whole Lotta Love”. More could (and probably should) have been written about the motivations behind the song choices in this album, the production, and the fact that a planned sequel never came to fruition. Sachs notes that Burnett had wanted, with Raising Sand, to create “a new dimension in sound”. Perhaps there’s more to this story that can be mined in future magazine features. T Bone Burnett was a St. Louis-born Texan raised Christian who first visited Los Angeles in 1967, surprised that the glittering black and white environment he’d envisioned -- cool and care-free like the TV lives of Ricky Nelson and Ed “Kookie” Byrnes -- was a fantasy. He fit in well with the Laurel Canyon crowd (Delaney and Bonnie, Taj Mahal, Leon Russell), and he kicked around for a while as a working musician. His own work, perhaps best exemplified much later in 1983’s “Proof Through The Night”, was bitter, moody, and effective, especially the song “Hefner and Disney”, a spoken word number that imagined these two characters as the essence of American corruption. It’s this possibility in his career trajectory that makes for the most compelling reading in T Bone Burnett. The relatively large section devoted to the motivations behind curating the source music and writing the score to O Brother, Where Art Thou? nicely sets forth Burnett’s ongoing mission statement. The film is a '30s depression-era re-telling of Homer’s The Odyssey. Quirky and goofy, yet with moments of sheer beauty, we follow escaped chain gang convict Everett (George Clooney) and his pals as they make their way across the American South, through floods, and the Klan, and other struggles on their way home. "In recording period music," Burnett notes to Sachs, "people usually are so focused on getting the form right that they miss the content." Sachs does a good job noting that with this film, and especially Ralph Stanley’s chilling a capella recording of “O Death”, the music came first. If the Coen Brothers’ O Brother, Where Art Thou? ushered in the marketability of “Americana” as a form to northern audiences and helped make Mumford and Sons (among others) fashionable for a while, Burnett seems justifiably resistant towards such labeling. Readers of this book would have been better served had Sachs spent more than just approximately four pages examining the way Burnett wrote original work and developed the source music for 2013’s Inside Llewyn Davis. This is another challenging Coen Brothers film with a lead character who is very difficult to like, though it provided a star-making opportunity for Oscar Isaacs. It covers a week in the life of the lead character, early 1961, navigating the folk music world of New York City. The film proved controversial to survivors of the scene who thought it disparaged Dave Von Ronk (on whom it was apparently very loosely based.) It’s fascinating to read that Burnett worked closely with Isaacs, immersed the young star in Tom Waits recordings, and built a back story of who this guy is and where he's going. The story about how Burnett (and supporting actor Justin Timberlake) wrote the period era Cold War novelty pop song “Please Mr. Kennedy” demonstrates how fully the former immerses himself in creating an authentic mood for the film scores he’s hired to develop. The film ends with the unseen appearance of Bob Dylan on the scene, thereby completely changing the rules and shifting the power regarding who would become the “voice of a generation”. As with all the genres he’s encountered along the way, T Bone Burnett is both respectful of the legacy and ready to take it to a different level. The essence of T Bone Burnett may indeed remain elusive by the end of this book, and perhaps even at 69, he is a work in progress. He’s a difficult subject to contain. Is he a performer? Is he a curator? Is he, like Dylan, primarily subservient to the text? 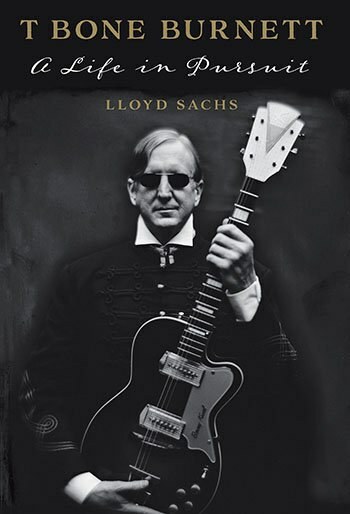 Ultimately, while it could have been better served if it looked primarily at T Bone Burnett’s film work, or landmark collaborations like Raising Sand, T Bone Burnett: A Life in Pursuit is an admirable, comprehensive, relatively quick read through the life and times of a musical force whose journey is far from over.